Outstanding Versatility and Cost-Performance in a VTR that Answers the Call for Universal HD Video Production As HD broadcasting and cinema continue to expand around the globe, the AJ-HD1400 helps you keep pace with the growing demand for high-quality HD content. This compact, economical desktop VTR records and plays in all of the world's HD broadcasting formats. It provides 720/1080 video format cross conversion and HD/SD down/up conversion. Also providing SD playback functions, the versatile AJ-HD1400 lets you produce video content for a variety of applications in all regions of the world. The AJ-HD1400 makes a good fit in an AJ-HDC27H, VariCam HD production system where the need for DVCPRO HD quality is great. It can convert data from native 720p sources for output as 1080/24p or 25p data, and it adds a built-in function for gamma conversion of F.REC cine-gamma sources. 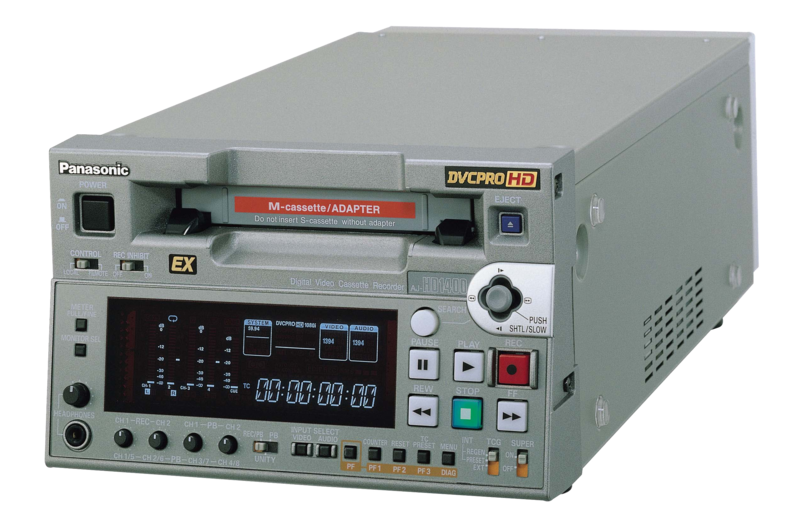 The AJ-HD1400 comes equipped with IEEE 1394 and HD-SDI digital input/output and a 9-pin remote interface for assemble/insert editing. From field recording to nonlinear and instudio editing, the AJ-HD1400 is a practical, reliable solution to a host of HD production needs. The AJ-HD1400 also offers outstanding cost-performance. The AJ-HD1400 makes it possible to configure an HD production system that's cost equivalent to many SD systems.